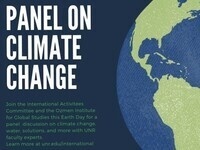 The International Activities Committee and the Ozmen Institute for Global Studies invites you to a panel discussion on climate change this coming Earth Day, on April 22nd, 2019. The panel discussion will be a chance for discovery and discourse from several affiliated partners of the Institute from across the University of Nevada, Reno campus. With mounting environmental issues, and being a world-renown research institute, our topics of discussion will revolve around climate change, water, and solutions.